You may not know this, but tomorrow is “bring yourself to work day”, at least it is for me. When I woke up this morning I decided not to wear a jacket and not to take my umbrella to work. Yesterday was so warm, and our office was so hot, that me in my shirt and vest and jacket was just not working. So today, I thought looking through the window – it’s bright you don’t need a jacket, you don’t need an umbrella – why are you carrying all of this stuff around each day that you clearly don’t need? Then at lunchtime, from my 12th floor office window with a great view of St. Paul’s, I witnessed a thunderstorm. It poured down with rain. I had no jacket and no umbrella and what’s more, I had planned to go out that evening for a meal. At the meal, we had some good company, food and conversation – at dishoom’s in Shoreditch. We talked about 360 degree feedback and how sometimes this can work and sometimes not. People seem more comfortable to give feedback anonymously – and we talked about Ricky Gervais in the film the invention of lying. We naturally put up barriers at work that hide who we are when we either pretend or use barriers as a defence mechanism. And what about the rest of the day? Well despite not having a jacket or umbrella – I was fine. The storm passed, the sun came out and I made it home. So tomorrow when I wake up, I’m not going to worry about what to take and what not to take to work. What barriers to put up or who to pretend to be. I’m just going to do my best to do my work and work to do my best because tomorrow, I’ve decided, is bring yourself to work day. Just want to say your article is amazing. The clarity in your post is simply great..
your site has the potential to become very popular. I had been extremely pleased to uncover this web site. F*ckin’ remarkable things here. I’m very satisfied to peer your article. Thank you so much and i’m looking forward to touch you. Will you kindly drop me a mail? and this fantastic comment from the BBC themselves. I’m extremely impressed with your writing skills as well as with the layout on your weblog. Is this a paid theme or did you modify it yourself? Anyway keep up the excellent quality writing, it’s rare to see a great blog like this one these days. You will appreciate that I don’t have the time – with so many great comments like these to thank you all individually. But I can assure you – that each one is read and enjoyed. I wanted to take the time today to publish an extract, just so that you know you – my fans – are not forgotten. Unfortunately, there is a button I have to click to make these comments visible on the site and as you will no doubt have read in my previous post to this one – titled sweating the small stuff my life is full of tiny individual tasks that rarely get completed. I am a detailed kind of person – and feeling the detail is important, as I do, I can’t unfortunately allow these comments to appear uncensored on my site – no matter how wonderful they are. Sorry! So to all those who take the time and effort to praise my work – even if the odd one or two might be automated through some kind of bot – thank you. Your praise is really making my life worthwhile. Here’s something just for you. I have become list obsessed. In the morning I look at my list. Through the day I measure myself by the number of tasks I’ve ticked off – and in the evening I wonder if I could have done more. What kind of a life is that? Last week, I found myself questioning the methods I have learnt and adopted over the last couple of years and wondered whether they were making me happy or helping me to get anywhere – and I came across this interesting site don’t sweat. The author and his wife have taught America, through 25 million copies of a range of books, how to not worry so much about little details – so it seems. The problem with my lists – is that they contain detail. Lots of detail about small stuff. I’ve found over time that there is no point having an item on the list that is a big picture item “Do the garden.” As it needs to be specific to get things done, so I have detailed items “Cut the grass”, “Pick up litter” etc. But the problem with detailed lists is that there’s a lot of small things – which in turn looks like a big problem – a long list. And this weekend – I found myself thinking about the small details – as I’ve been reading Atul Gawande’s book – the Checklist Manifesto. And realising that indeed, someone does need to paying attention to the small details of things – and if it’s not you – then who is it. As the world mourns the death of Muhammad Ali I wondered yesterday how he got to have the reputation of being the greatest. Was it a self-fulfilling prophesy? Did he just have an enormous belief in himself. I found myself reading quotes of Ali’s and the page that I liked most from my google search was the top 30 quotes of Ali on the Telegraph WebSite. And the quote that spoke to me most was the one at the start and end of this page. Maybe I am reading into the quote something that isn’t there and wasn’t ever intended to be there. But to me Ali’s quote says – take care of the detail. Do your homework, put the effort in, know your goal and how to achieve it. The media portrays the public view of the man, but away from the spotlight he was putting in the effort day-in day-out to be the greatest. He believed he was, and then he did the work to show that he was. For now at least then, I will keep my lists, I will know the things I need to do and I will keep ticking them off. So which of his many quotes speaks most to you? I don’t know why value statements fascinate me so much. But recently I compared the ones I have seen at Wexham Park Hospital with the ones I have seen at the place where I work. They are remarkably similar. In fact working together as one team was common to both. For some time I rated Wexham Park as a poor hospital, the kind of hospital that I would rather not go to. Recently the hospital has a different feel to it when I go there – I feel a lot more positive. 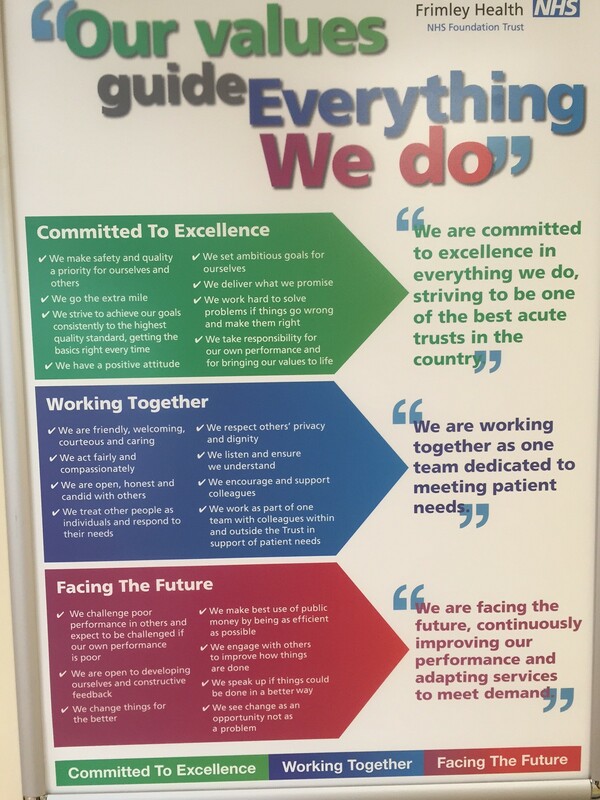 The hospital proudly shows its new CQC rating of ‘good’ alongside a quotation by one of the inspectors I presume saying that it’s experienced a major turnaround. I wish in retrospect I had taken a picture of that as well as the values statement shown below. But perhaps I just feel so positive about it because of the level of detail and care that individuals have shown looking after one of our family who has recently had a diagnosis of ITP. We have had regular blood tests to establish platelet levels and monitor their trend over time. The team at Wexham has checked raised indicators in the blood to follow relatively small “lines of enquiry” to understand the cause of ITP (something that I wasn’t expecting, by the nature of the condition the trigger or cause is usually left undiagnosed). They have consulted a range of clinicians in both paediatricts and haemotology and generally had a joined up approach to care. One doctor last week phoned both of us parents to confirm the time of an appointment and to keep us in the loop. So thank you Wexham. I don’t know what you’re doing differently and whether the value statement is helping. But whatever it is – please keep it up. During the Expedition she will be working alongside organisations that are committed to improving the environments and the lives of local communities. The work will range from helping rural people create a more sustainable future, to supporting minority ethnic groups in Ecuador. We are raising money by organising a coach trip from Beaconsfield to Matilda the Musical on February 4th. And have some of the best stall tickets (face value £67.50) to see Matilda the Musical. Cost £70 all in. From the Royal Shakespeare Company and inspired by the book by one of the best-loved British authors Roald Dahl Matilda has won over 50 major international awards, including 12 for Best Musical. Matilda continues to delight audiences in London, on Broadway and in Sydney. For those of us who have been criticising England’s performance and the result to Australia on Saturday. I want to remind us all of these words from Theodore Roosevelt. Leo Babauta maintains a good web site Zen Habits. I try and read the posts each time they arrive in my mailbox – but I don’t always get the time. I decided today to read the last 5 posts emails I received and paraphrase the key messages that I like. With some enjoyable prose the text encourages you to return to the present by focusing on your breath in times of personal turbulence. Discipline comes with practice. Turn towards problems – stick to habits – look for the good inherent in the activity rather than just the outcome and learn to live with being uncomfortable. But most of all – practice. By introducing rules into your life you can avoid spending energy taking lots of small decisions every day. Eat the same thing every day for example and when you go out to a restaurant it will be real treat. Make sure your daily routine puts the important things first and limit yourself. By treating activities like rituals you can bring your full attention to them and find joy and appreciation in them. Leo shares some thoughts on his family trip to the Sierra Nevada mountains. By spending time together as a family they really appreciate the outdoors and the things nature has to offer as they disconnect from the internet and reconnect with each other. A post that categorises at least 14 different excuses that the mind will give you as a reason for not sticking to your plans. And a prescriptive method for recognising the excuse, fighting back and pushing through to the result that you wanted in the first place. If you’re interested in reading more or signing up to Leo’s posts which are gently challenging and inspiring – go get them at Zen Habits. I remember seeing a poster a few years ago with the powerful message that ‘Routine Kills’. It was a literal message aimed at service men and women who could become targets, for snipers or an ambush, if the enemy knew their routine. I liked that poster a lot. I was fresh in a new job and thirsty for ideas. This one hit home with me because I hated routine. I was young and routine to me was boring. I didn’t want to do the same thing day in and day out. I was looking for adventure. Today I feel very different about this. I am trying to embrace routine. Or should I say, I am trying to embrace structure. By introducing structure to my day, I know what I should be doing and when I should be doing it. I like this. I like the routine that takes away the humdrum of making choices. It’s nice not to have to make choices and instead to be swept along in the current of life. I am hoping, in this instance, that routine will bring life and will not kill. Perhaps it’s just because I am at a different stage in life that I feel differently now. Perhaps my attitudes have changed. Or maybe I have just become more boring? I’ve been inspired lately by reading lots of individual blogs. Celestine Chua’s Personal Excellence blog has a great warm welcoming tone and is full of brilliant ideas and suggestions. Matthew Woodward has also inspired me – mostly with his can do attitude and tell it like it is style. I love the idea of personal improvement; the idea that each day we can inspire ourselves to improve. What better way than to replace bad habits with good ones. I started reading Charles Duhigg’s book yesterday. And I’m now looking ou for bad habits that I can change into successful ones. This is not a new area for me by any means. Some years ago I read Stephen Covey’s book – the 7 Habits of Highly Effective People and I often think about the powerful messages in that book. I believe that from the moment I wake up until the moment I fall asleep I am a creature of habit. Some of these habits probably aren’t too bad, but I’ve realised I’ve got at least three really bad ones that I think I should try and change. My biggest habit, I believe, is procrastination. I put things off a lot. The next biggest, I would say, is that I don’t finish the things I start. A few weeks ago I came across an interesting article about a book by Charles Duhigg. His book, the power of habit, has received critical acclaim. I forgot about this book until I started to write this post. I googled my title and details of the book popped up again. Instead of writing today about the power of a habit I am going to start reading this book.